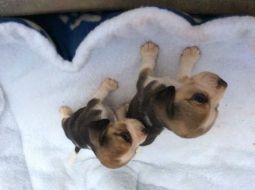 Beagle breeders links and breed information on pups4sale.com.au. 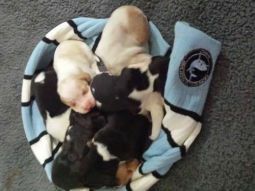 pups4sale testimonial: 6 of my 7 pups sold from your web site. Cant believe the response. Thanks again. All sold now. Few dog breeds can trace their hunting lineage back as far as the proud Beagle can. Their incredible instincts (and nose) have been renowned in Europe for over 1000 years!. 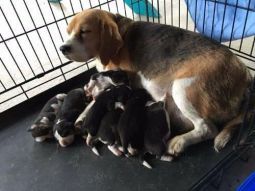 Thanks to Semeru Beagles & Tollers for the pictures of Beagle puppies & adults used on this page, and the additional information provided. History – While this stout little breed adopted the name “Beagle” in 1400s England, they were probably hunting with humans long before that (possibly as far back as 500 B.C. in Ancient Greece). The name Beagle was either derived from the French meaning “open throat,” or from the Old English/French/Celtic term for “small”…but if you’ve ever heard the distinct “bay” of a Beagle, you’ll know it was probably the former rather than the latter! (Beagles don’t really bark as normal dogs, but instead “bay” or howl. This is thought to have been bred into them during their early days as hunting companions. They were often so far ahead of the hunters that a simple bark could not be heard, and the bay/howl could travel father distances to help hunters key in on their dog’s direction and location). Their ability and endurance was legendary, but in the early days, a Beagle’s appearance could vary; they were bred to fit the territory their masters hunted. As a result, there were some variances in size, structure, temperament, and even coloring. 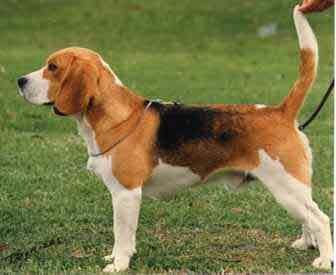 So, in the 1800s, breeders began to unify the breed, finally leading to the Beagle’s recognition by the AKC in 1885. Monumental historic figures such as William the Conqueror, Edward II, and Henry VII all were known to trumpet the breed in one form or another. Even Queen Elizabeth I was exceedingly fond of her “pocket Beagles” (bred small enough to almost “fit in your pocket”), which she took on the hunt with her by carrying in a side bag! But perhaps the most famous Beagle of all made his debut on October 4, 1950…in the form of Charles Schulz’s beloved character, Snoopy. Other loveable fictional Beagles include Underdog, Odie (Garfield the cat’s sidekick), and Gromit (from Wallace and Gromit), just to name a few. In modern day life, Beagles are hard at work everywhere! They are, of course, still devotedly used for hunting. But they are also used in the United States Department of Agriculture, the Australian Quarantine and Inspection Service, the Ministry of Agriculture and Forestry of New Zealand, and in the countries of Canada, Japan, and the People's Republic of China as “Beagle Brigades,” checking luggage coming into the country for food items, narcotics, and explosives. 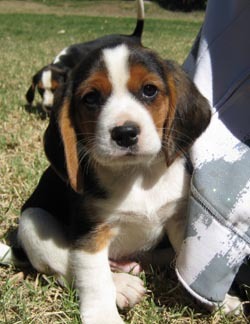 Beagles have been used in termite detection, as medical alert dogs, as therapy dogs, and as search and rescue dogs after natural (and unnatural) disasters like hurricanes and explosions. Thanks to its compact size, remarkable instincts, uncanny nose, whip-smart intelligence, and affable nature, the Beagle is one of the most adaptable and amazing dogs around! 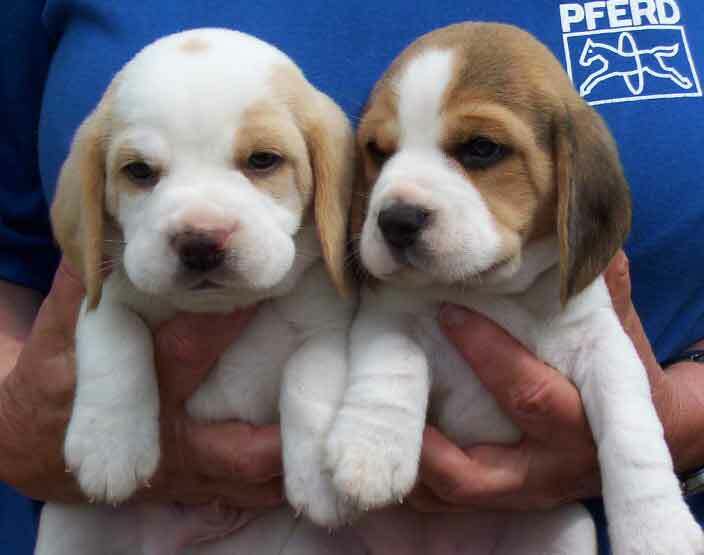 Breed Standards – Though uniformity was brought into the breed in the late 1800s, there is still some variety in sizes and shapes of Beagle. In terms of breed standards, there are two main height classes: 13 - 16 inches (33 – 38 cm) and under 13 inches (33 cm). Males are usually 14 - 16 inches (36 - 41cm), and females generally run 13 - 15 inches (33 - 38cm). Average weight of the males is 22 - 25 pounds (10 – 11 kg), and females 20 - 23 pounds (9 – 10 kg). Colors of coats include black, tan, white, bluetick, redtick, lemon, red, blue, brown, and fawn…and dozens of combinations therein. Other characteristics include a relatively broad head, short muzzle, hazel or brown eyes (very imploring and hound-like in nature), large, long ears that are low set on the head, slightly curved tail (tipped with white), with a stout, muscular body and legs shorter than the body is long. For any other specifics, you can also contact your local Beagle breeder. Energy – This enthusiastic little pup is really up for anything! Though some people think they require inordinate amounts of exercise, that’s not necessarily so. If provided a daily dose of walking or play (and opportunities to work those noses), these versatile companions can handle any living environment from a small apartment to a vast country home. Do keep in mind though, that just because Beagles love the outdoors does not mean that they can live in the outdoors full time. These dogs require a life indoors with their family (pack). And be sure to always use a leash on your walks… this dog is totally driven by smell and the hunt, so any little thing might call them off on a bounding adventure! Temperament – As a rule, Beagles are sweet, gentle, intelligent, social, and happy. They are absolutely pack animals, meaning that you and your family will become their pack. They are well-suited to a variety families, small and large, and they do well with other dogs and children (due to hunting instincts, pets other than dogs should probably be avoided or very carefully supervised). Beagles are trainable, but might require a firm hand (and patience). The smaller varieties, once trained, also make excellent companions for seniors (Beagles often like to lope-along and sniff at a slow pace). Like all dogs, Beagles can sometimes be a bit destructive or noisy, developing behavioral problems, if left alone too long and too often, but with a bit of daily exercise and a little training, a Beagle can make a wonderful companion! Health – Even though Beagles have a relatively long lifespan, 13-16 years, they are still prone to genetic problems. Some common heath concerns include epilepsy, chondroplasia (dwarfism), hypothyroidism, arthritis, glaucoma, retinal atrophy, and corneal dystrophy. Another issue to keep in mind is that Beagles notoriously love food. A lot! 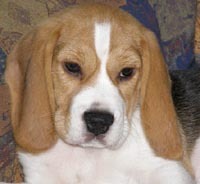 As a result, many older Beagles do suffer problems with weight (which causes any number of reciprocal health problems). So, it is up to the Beagle owners to care enough for their furry friend (with the terribly pleading eyes) to just say “no” to excess treats and food. Grooming – The smooth shorthaired coat of the Beagle an average shedder and pretty easy to care for! A going-over with a firm bristle brush every few days, and a bath (using mild soap) only when necessary should do it for grooming requirements. For a little freshening up in-between, you can use a good quality dry shampoo on occasion. There really is no need to take your Beagle to a groomer, unless you just don’t have the time, desire, or room to wash them yourself. Since their ears are long and floppy, it’s a good idea to check them carefully for signs of infection, dirt, or odor. Make sure they are thoroughly dried after bathing. You can take a mild astringent on a cotton ball and gently swab around the outer ear, but do not go any deeper into the ear canal…let your vet or groomer attend to that if necessary. Trim their nails once or twice a month, depending on how quickly they grow and how much exercise they get to wear them down naturally. 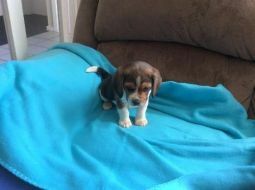 Your local Beagle breeder can provide even more guidelines, tips, and tricks in caring for your beloved Beagle. Negatives – The Beagle, as with most other dogs, can develop some behavioral problems if left alone too often or for too long a period of time, but nothing a bit of time and training can’t handle. They do have a nose that pretty much controls their body, so they are prone to follow ascent trail far and wide, over any terrain, with no regard for time or place…and if you are on the end of that leash, you will have to do your best to curb that reaction. It is advised that scent-involved play and exercise can be beneficial though, if only to keep their mind and natural instincts sharp and engaged. Make sure to keep an eye out for the genetic conditions that can crop up with the breed (but with love and care, your hound should live a long, happy life). And while some may find the Beagle’s distinctive, loud, deep-throated “baying” a bit alarming or annoying, most owners agree that it quickly becomes one of their most loveable and unique quirks. Positives – Beagles have been mankind’s loyal and doting companion, in one form or another, for perhaps over a thousand years, and for good reason! A compact powerhouse of instinct, bravery, endurance, kindness, love, humor, adventure, and intelligence, the Beagle makes one of the best four-legged companions you can find anywhere. With a relatively long lifespan, moderate exercise requirements, reasonable grooming needs, and the ability to comfortably adapt to a wide variety of living spaces, most people would be well-suited and wise to open up their hearts and homes to the bold and noble Beagle! 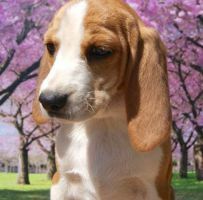 The information on this page is from an original article posted on the Daily Dog, entitled "Beagle: A Stout Dog Breed With A Mighty Nose".